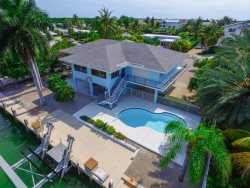 Brand new 4/3 home built in 2018, located a 1 and a 1/2 mile from Sombrero beach. Your family will fall in love with the fabulous modern beach decor in this house. This home has a spacious layout including one King master suite, one Queen master suite, and two Queen bedrooms. Bringing your boat will be a breeze! Your dock is conveniently located directly behind the home and there is ample parking for cars and your boat trailer. After your day out on the water, cook your catch on the gas grill and enjoy a meal outdoors. Want to spend the day in? Take a dip in your private pool or enjoy reading a book on your shaded patio. This home has a prime location and is a 1/4 mile from grocery stores, movie theater, boutique shops, restaurants and more! Sombrero beach has been ranked as one of the best beaches in the Florida Keys. Sombrero beach is the perfect place to lose track of time with its array of amenities including picnic pavilions, volleyball courts, restrooms, and showers. There is plenty of fun to have in Marathon from the Turtle Hospital, Aquarium Encounters, Dolphin Research Center, water sports and much more! Feel like exploring? Visit the southernmost point in the United States, Key West (located approximately 1 hour south of Marathon). From walking tours, trolley tours, restaurants and shops you will never run out of things to do there. Coco Plum Vacation Rentals provides a complimentary starter kit of soap, toilet paper, paper towels, dishwasher detergent, and laundry detergent. Guests will need to provide ongoing supplies for their stay.